Impress your family this holiday season with a delicate portobello mushroom wellington that will leave your guests begging for more. Remove the stems gently, so not to break the mushroom. Remove the gills. (I use a a pan scraper to remove the gills); do this carefully. You do not want the mushroom to break. Cook mushrooms face down for 5 minutes. Remove pan, and drain water from the pan into the sink. Flip the mushroom over and repeat. Lay on fresh paper towels on a flat surface again to drain further. *The reason you are partially cooking the mushrooms is to get the moisture out, so it does not ruin the puff pastry. Too much fluid will make your pastry soggy, which is not what you want to happen. While mushrooms drain, make your filling. In a medium skillet, saute shallots and garlic until translucent on medium heat. Add vegetable broth and continue cooking. Add rosemary, thyme, mustard, wine, and soy sauce. Stir often, until all the liquid dissipates from the pan. Take the puff pastry from the freezer the night before and place it in the refrigerator overnight to thaw. You want it still cold and from to make it work well. Using a small amount of flour on a hard surface (like your countertop), sprinkle to coat to avoid sticking. Roll the dough out slightly (not much); just enough to spread it a little thinner, but not too thin. I suggest you do not cut it until you have your mushroom stuffed, so you can individualize the size. With the pastry rolled out, take one mushroom at a time. Fill the center with the mushroom/shallot mixture, packing it down with a spoon. 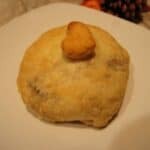 Being careful, cupping your hand over the filling, flip it upside down on the pastry dough. (Leave about an inch of dough around BEFORE placing it upside down) See pictures below. Cut around the mushroom , pulling up the dough as you go, securing it to the bottom of the mushroom. Again, place your hand underneath the mushroom and gently flip onto a baking sheet, stuff side up. Using extra dough, choose a little cookie cutting to embellish the top. I picked a small heart. Bake for 35 minutes at 375 degrees or until a beautiful brown. I serve with mashed potatoes.